First, you can choose how VPOP3 will connect to the Internet. Usually you will choose LAN Connection if VPOP3 is connecting through a router or firewall. Only choose Dial-up Connection if VPOP3 is to be responsible for dialing a modem itself. 1.import settings from an email client installed on the VPOP3 PC, in the same user account which VPOP3 is using. This is rarely useful. 2.use settings we have been told about a specific ISP. This will configure mail servers etc for that ISP. Note that this information has been provided to us by third parties so may not be correct or up to date, so you should check the details. 3.manually configure the mail server settings required by your ISP. This is usually the best option. Your ISP will be able to tell you the incoming and mail server names that you need to use, and your username & password. 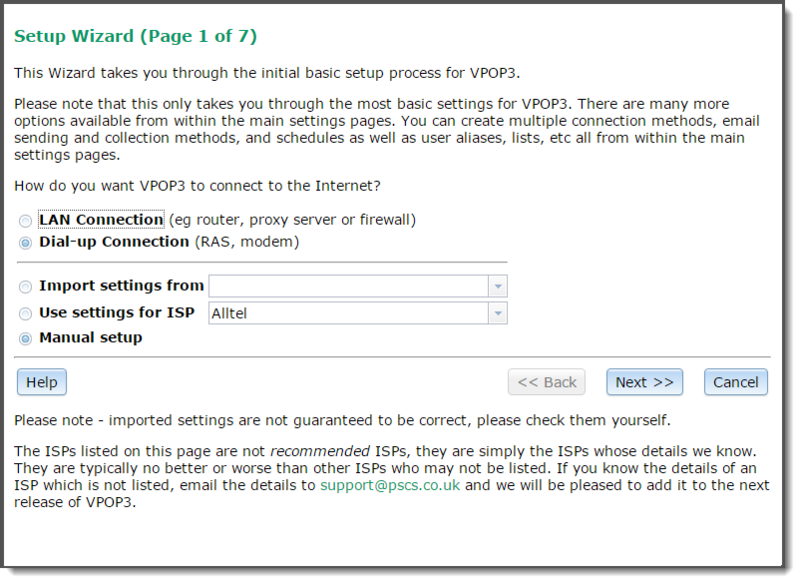 Whichever of these options you choose, the next page will depend on whether you are connecting using LAN or dial-up. If you import the settings from somewhere, it will simply pre-populate the setting fields you will see on the later pages.